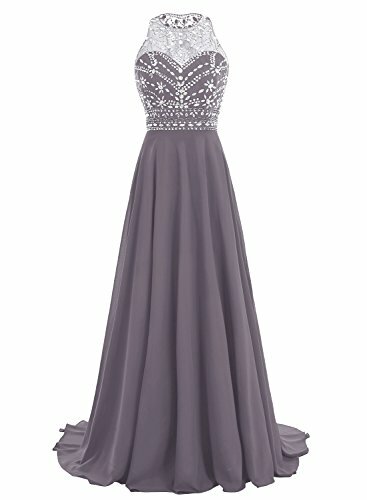 Suitable as evening dresses, homecoming dresses, party dress, prom gown, cocktail dress, dance dresses, ball party dress, banquet dress, Festival event dresses, Celebrity dresses and other formal dress, suitable for all ages. 1. Sheer scoop neckline design together with exquisite beadings dotted on the upper part create a gorgeous and elegant temperament. 2. Delicate demensionally cutting, concise and pure, is in line with most beauty-lovers' aesthetic view. All of these unique details make this design more prominent; All of our dresses are handmade by experienced tailors. You will absolutely love it! Any other questions, please contact us freely, we are always at your service. Please Refer to Our Bbonlinedress Size Chart Image On the Left While Choosing Size to Make Sure It Will Fit; Do Not Use The Size Chart Link Amazon Provide; Our Size Is Different From Standard US Size. A-Line Style; Exquisite Beads; See-through Neckline; Hollow Back; Zipper Closure; 100% Brand New; Handmade. Suitable as Prom Dress, Evening Party Dress, Cocktail Dress, Wedding Dress, Homecoming Dress, Dance Dress and Other Formal Dress.